Made of durable, shatter-proof plastic, these rugged tray hold cent, nickel, dime, quarter, half dollar and small dollar coin wrappers. Color coded boxes makes for easy organization, sorting and processing of rolled coins. Rolled Coin Trays are available in large capacity boxes that can hold up to 50 coin rolls. The small interlocking coin trays hold 10 rolls. $25 storage capacity. Accomodates large quantities of coin rolls for easy storage. Slots at both ends allow for quick check of contents. $100 storage capacity. Accomodates large quantities of coin rolls for easy storage. Slots at both ends allow for quick check of contents. $200 storage capacity. Accomodates large quantities of coin rolls for easy storage. Slots at both ends allow for quick check of contents. $300 storage capacity. Accomodates large quantities of coin rolls for easy storage. Slots at both ends allow for quick check of contents. $600 storage capacity. Accomodates large quantities of coin rolls for easy storage. Slots at both ends allow for quick check of contents. All-purpose interlocking coin trays for full rolls. Trays interlock with 2194-2202. Check out the chatter. Join in the conversation! 1/10 oz Gold Eagle bulk 16mm direct fit Guardhouse holders. 250 count box. 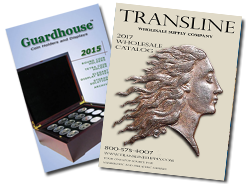 Copyright 2019 © Transline Wholesale Coin Supplies All rights reserved. Trademarks found on this website are the property of their respective owners and serve to clearly identify such owners as the original source of goods distributed by Transline. Copyright Notice: No portion of this website, including product images, may be reproduced or copied without the express written consent of Transline.